At Pensaki© (Japanese for fountain pen) all cards and letters are written by robots with a human handwriting style. For this purpose, fountain pens or ballpoint pens are clamped in a device, which then pens your message. 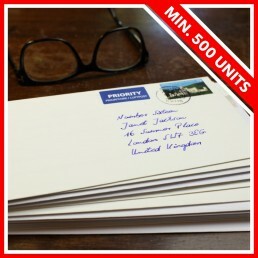 Your messages and addresses are easily entered online. In addition, the data can be transferred via the Pensaki API for Robot Handwriting from all common CRM systems. Before mailing the letters our friendly employees check the quality manually. In the digital age human societies have moved to content abundance and attention scarcity. As a result the daily fight for attention makes its critical to consider many details, supposedly little things decide whether communication is effective, i.e. successful or not. 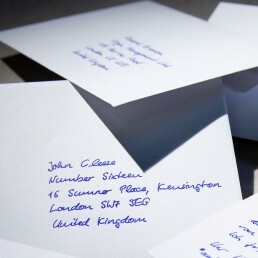 Handwritten letters are a very special way to make your message stand out from the crowd, i.e. your competition. Because behind every customer is always a human individual who wants to be perceived as such, i.e. unique, valued and understood. Who takes this into account in the context of marketing campaigns will be rewarded with outstanding success, provided that the success factors have been taken into account. Especially crisp, relevant and personal messages are rewarded with great success. 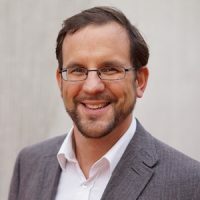 A high-quality communication approach is particularly critical for the success of B2B lead generation campaigns, i.e when you want to engage with senior executives and decision-makers instead of time bandits. 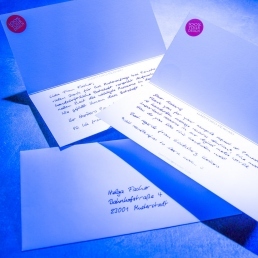 Handwritten invitations can play a critical role in this context with RSVP response rates north of 20 percent. 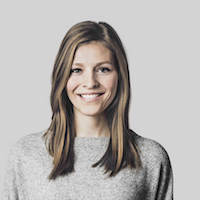 An Emotional Connection Matters More than Customer Satisfaction. That's why great brands aim for customers' hearts, not their wallets. Making an investment in optimizing the on and offline end-to-end customer experience has become critical for all leading companies. 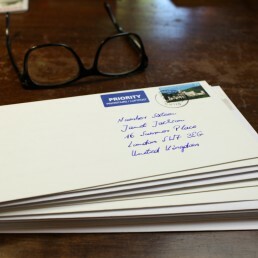 Handwritten messages can make a huge difference here. "Wonderful. A lovely personal touch which was well received by all the recipients!" "Hello Pensaki Team, I was very excited about the quality of the cards and more importantly, the recipients were very happy about it. The quality of the handwriting style, paper and shipping can only be rated with five stars. Thank you very much!" "Excellent as always! 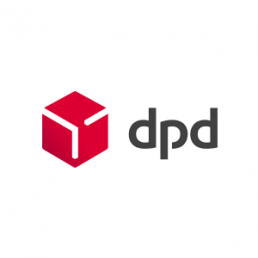 Fast processing, great support, easy handling!" 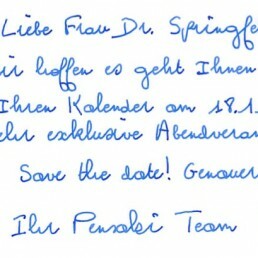 "We are really excited about how perfect and authentic the handwriting looks." 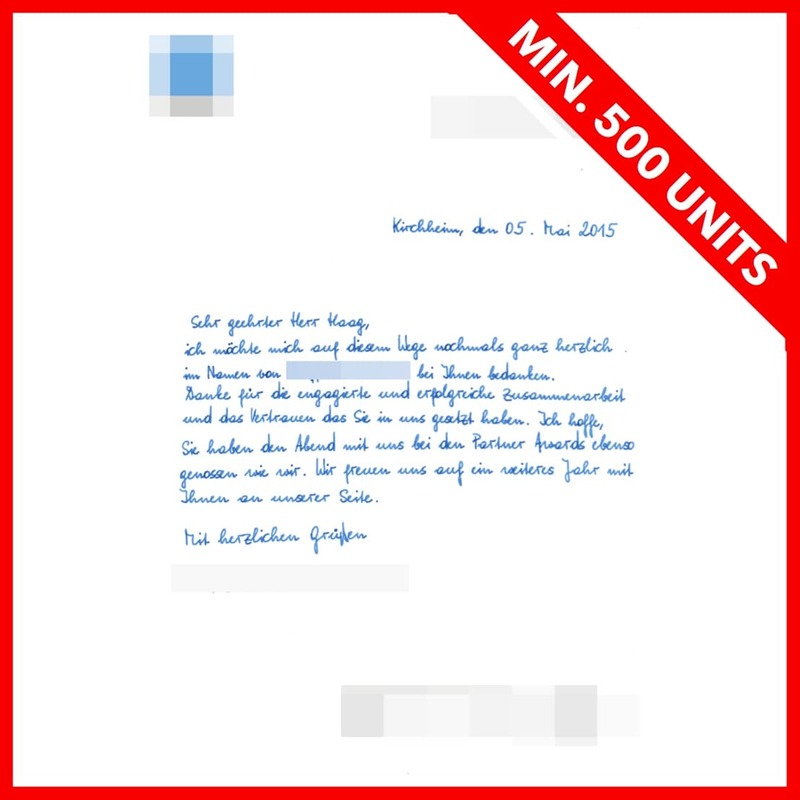 "We are very satisfied with the result! 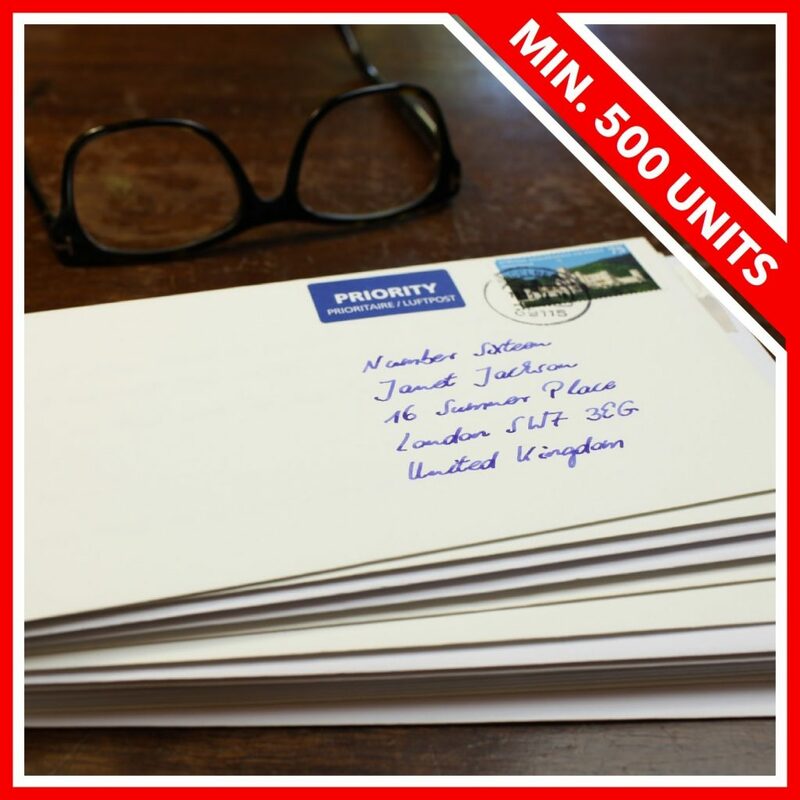 The cards look like they were written by hand and our customers are very happy about it." "The service is very good, very friendly staff, the individual wishes are taken into account. Lightning-fast processing and shipping. " You can create and order all letters directly online at Pensaki. 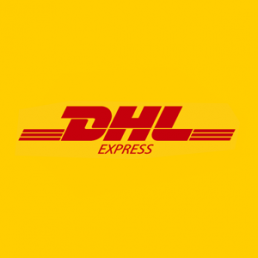 All standard letters will be mailed globally with Deutsche Post. Also mail-merge campaigns with 10,000+ recipients can be easily created online with Pensaki. Read here more about how Pensaki works. Please always consider the very important success factors in order to achieve also outstanding results with Pensaki. By the way, the golden rule is: It can't be important if it doesn't fit on one page! So please keep the letters free from plain advertising and buzzwords. Keep it real! 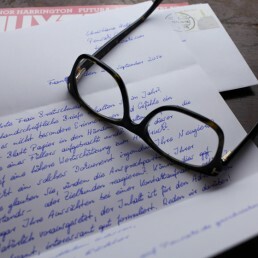 Successful letters are always personal, relevant and concise (read more here). 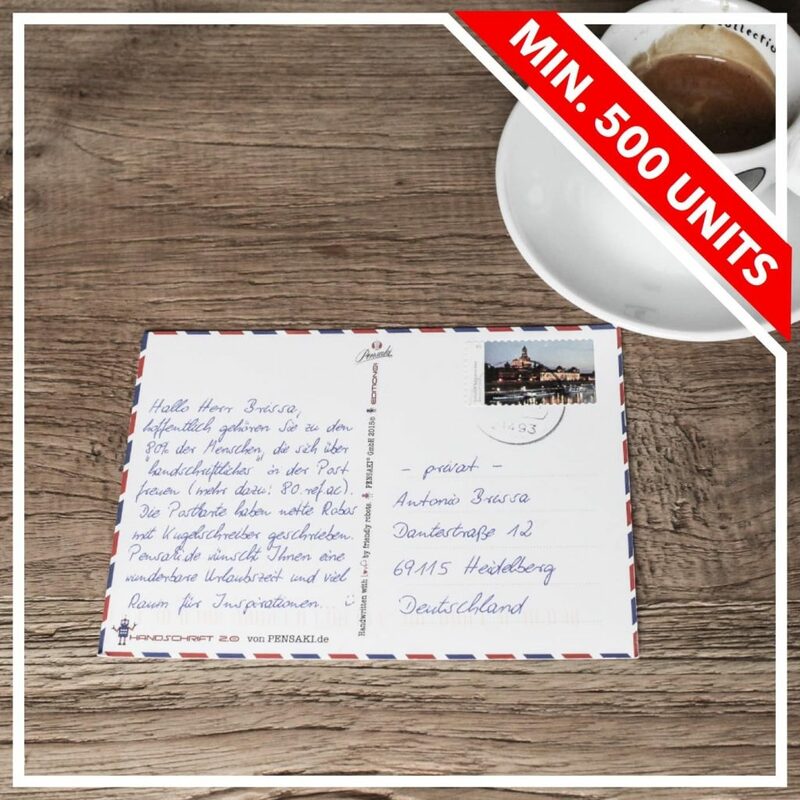 All online letters will be mailed globally via Deutsche Post mail, out of Germany. 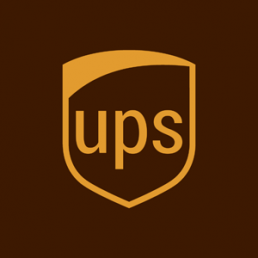 With 100+ letters we can ship you our standard letters via UPS, DPD or DHL. In the case of enterprise campaigns (with 500+ units) more shipment options are available. Pensaki customers achieve outstanding results with our handwritten letters, provided that the success factors have been taken into account. Those who take them into account will be rewarded with outstanding success. Neutral letters are particularly successful in the lead generation context. This makes our unbranded standard formats ideal for such campaigns. 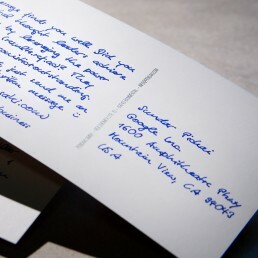 Handwritten campaigns can provide noteworthy business results both in the B2B and B2C context. Driving customer retention campaigns with handwritten notes can make a huge difference when you want to convert satisfied customers to emotionally connected fans. An emotional connection matters a lot more than only customer satisfaction. That's why great brands aim for customers' hearts, not their wallets. 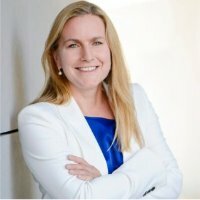 Making an investment in optimizing the on and offline end-to-end customer experience has become critical for all leading companies. 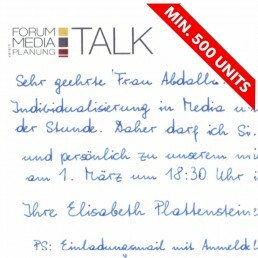 Handwritten messages can make a huge difference here. 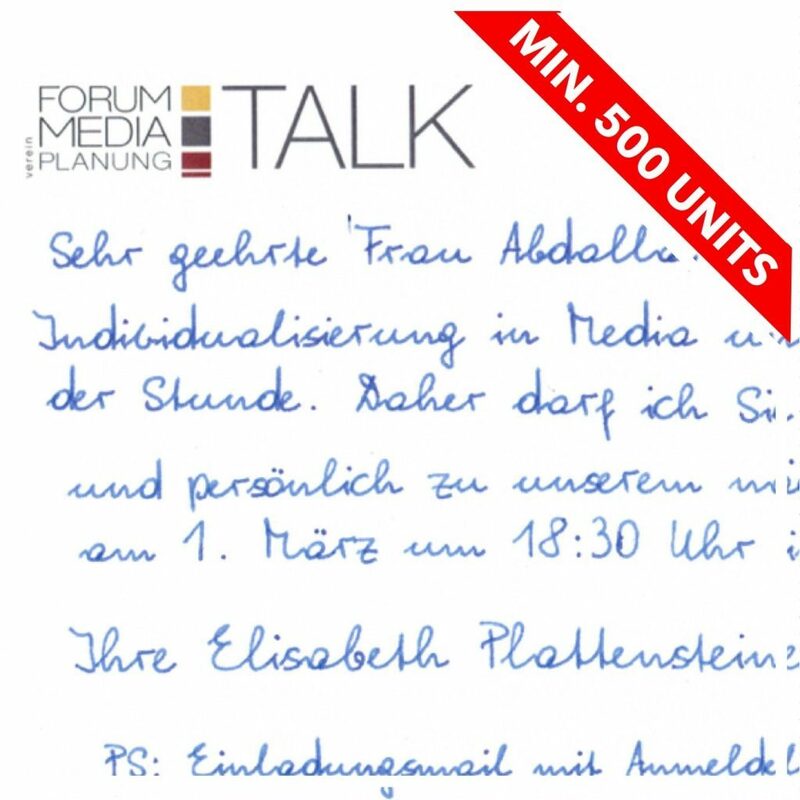 "We have invited several thousand European decision makers to our business festival with Pensaki handwritten invitations - the response was great." 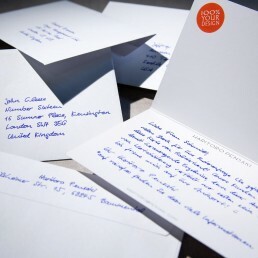 "Good old handwriting boosts leads for DIGITAL Oracle Eloqua CAMPAIGN, and so lead conversion rates are around 40%!". 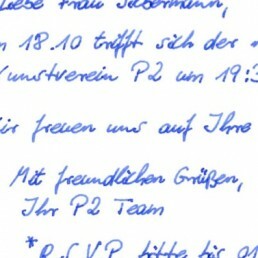 "We've received great feedback and we had an attendance record, largely due to the Pensaki's (handwritten) invitation". 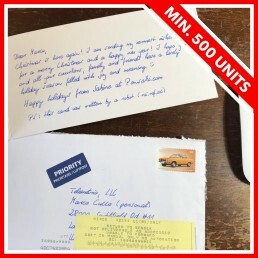 "Pensaki is possibly the coolest marketing service I've seen, and this is due to their on demand, handwritten, direct mail services"
For all tailor-made enterprise solutions (with 500+ letters) you can select one of our free standard handwriting styles or your own. 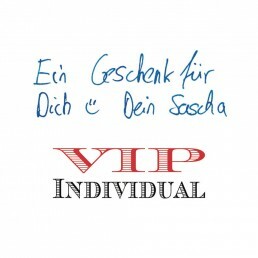 Using a personal VIP handwriting styles is obviously the most exclusive solution as nobody else will be using this style. Only writing by yourself is nicer. 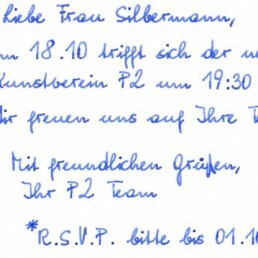 Obviously nothing beats a letter than you pen yourself, in your unique handwriting style. 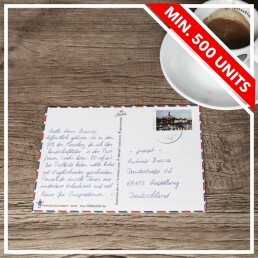 But if you lack a legible handwriting style or any of the required ingredients (quality stationery, post stamps, a mailbox to mail your handcrafted letters) Pensaki provides the very best alternative you can get online. You type, and we'll take care of the rest. Every single Pensaki letter is written for you with a fountain pen, this obviously includes the envelopes. 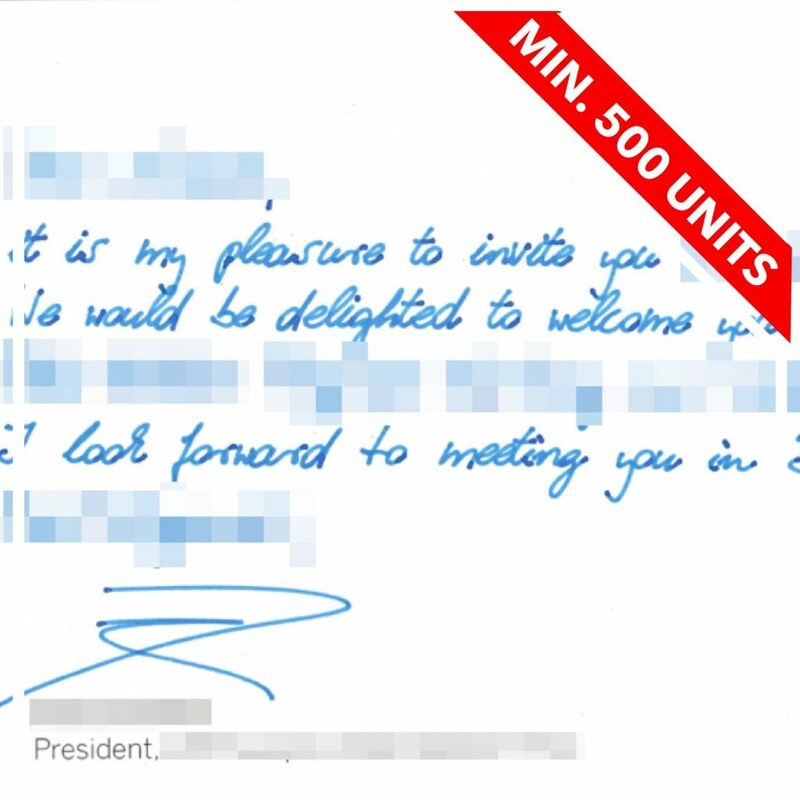 All handwritten envelopes are completely hand addressed by friendly robots too. 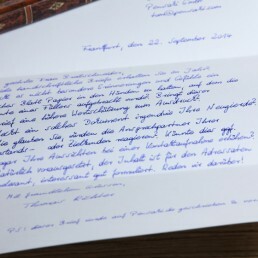 Everything else is taken care of by our friendly staff, including bringing your letters to the post office in Germany. 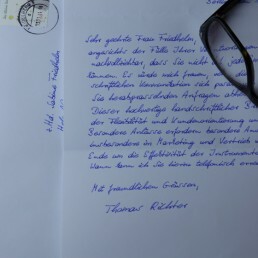 "If you look closely, you see the irregularly distributed ink, the minimal impression of the fountain pen in the paper, the letter lines that are not exactly parallel." 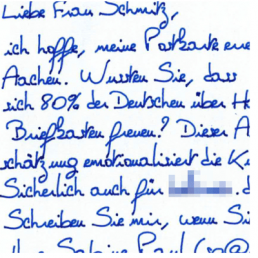 80% of Germans are delighted when the find something handwritten in their mailbox, and this especially refers to the "digital natives". For digital natives digital is nothing new, i.e. they especially appreciate the beauty of bespoke offline messages. 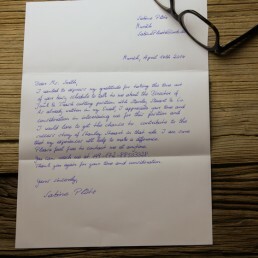 Customer love or appreciation in general can be expressed particularly well in handwriting. A personal message in handwriting surprises and delights mostly every recipient, because this expression of gratitude make a huge difference. 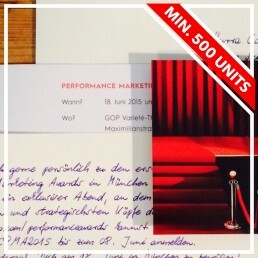 If the success factors are taken into account, outstanding results will be achieved with smart handwritten campaigns. 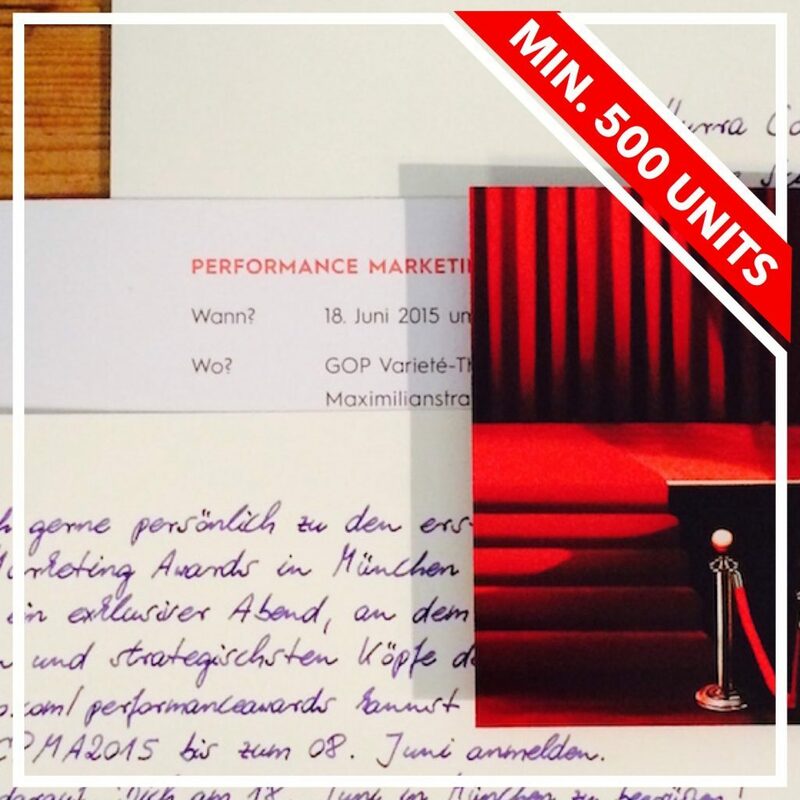 For example, a 40% response rate on cold contacts is not so bad, don't you agree? 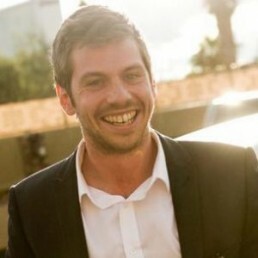 Are you interested in evaluating a tailor-made campaign with Pensaki? You'll Believe It When You See It!